Santa Lucia Highlands Pinot Noir grapes - coming to your glass soon. Three weeks after the initial harvest for sparkling wine grapes, the harvest for still wine grapes has begun in Monterey County. A culmination of a years’ worth of efforts, harvest is a time of excitement and sleepless nights. Harvest lights from the vineyards can be seen throughout the Salinas Valley in the predawn hours. Night time harvesting keeps the grapes cool to preserve the sugar levels and conserve energy. Harvest for sparkling wines began in early August with Caraccioli Cellars, Scheid Vineyards, and Pessagno Winery. They, along with others, are now beginning harvest for their still wines. Scott Caraccioli of Caraccioli Cellars shared, “The 2017 vintage looks to be a high-quality vintage. There is a heightened expression of fruit coupled with integrated acidity which should lead to wines that drink well in their youth and have the capacity to age.” In addition to the early harvest of fruit for their signature bubbles, Caraccioli just started harvesting fruit for still Rosé. Although harvest has begun gently, the pace will pick up in the next two weeks. 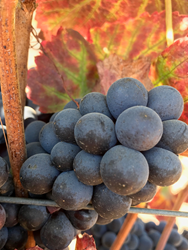 Andy Mitchell of Hahn Family Wines and Jeff Pomo of Constellation Brands, report that they will begin their harvest either next week or the week after. Harvest will actively continue through the end of October and could extend into early November given a continuation of moderate weather patterns. Monterey County cultivates 46,000 acres of wine grapes, growing more Chardonnay and Pinot Noir grapes than any other county in California. Follow the excitement of Monterey County’s harvest as it unfolds on Instagram and Facebook: MontereyWines and Montereywines.org. Photos from the harvest are available here. Formed in 1973, the Monterey County Vintners & Growers’ Association (MCVGA) brings together the talents and resources of winegrowers, winemakers, and our extended community to promote and support leadership in the art, science, and business of wine. By standing together, we strengthen the Monterey Wine Country™ brand and bring awareness to the region.